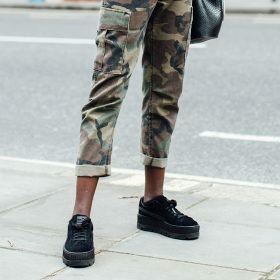 Initially, all that comes to mind when you look at women’s cargo pants are throwback trends and memories from your youth when in fact cargo pants are coming back in full-force as a luxury trend. Gone are the days when women’s cargo pants are considered a grungy look at these pocket-heavy pants are paired with some strappy sandals. When looking for a new pair of cargo pants find yourself a loose-fitting pair – in the classic Khaki or a light brown – which sit high-waisted. Keep the look neutral by pairing them with a ruffled white top or black blouse, or feeling bold? Why not go for a double khaki look! Discover the latest trends with Fashiola.